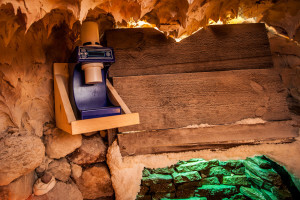 Halotherapy is a 100 % natural, drug-free, safe, noninvasive and pleasant treatment using a controlled air medium that simulates the microclimate of a natural salt cave or mine. “Halos” in Greek means salt, Celtic word “hal” stands for salt and also clean and holy. Halotherapy is performed in a special room, the walls and floor of which are covered by tremendous amount of salt, in so called climatic-inhalation salt chambers or simply in salt caves. Nowadays the powerful development of pharmacology and industrial production of medicines encourages the growth of treatment by medication. Availability, simplicity of application and rapid effect are priorities of pharmacotherapy. Industrially produced medicines are efficient and today nearly irreplaceable for acute illnesses. However, during long term usage together with therapeutic effects, medicines can cause pathologic conditions that are connected with side effects. Many allergic conditions and autoimmunal processes are caused by industrially produced medicines. Furthermore treatment by medication does not restore the own defense mechanisms of the body – immunity. These are the main reasons why physicians turn back to the experience of natural healing factors and carry out investigations in order to find medication-free treatment methods. Halotherapy is one of such methods. Treatment in natural salt caves and mines – Speleotherapy (“speleos” in Greek means a cave) – has been known for a long time. The efficacy of speleotherapy is associated with the unique cave microclimate. The natural dry sodium chloride (ordinary salt) aerosol is the major curative factor of the cave microclimate. It is formed by the convective diffusion from salt walls due to natural humidity in the cave. Other factors such as comfortable humidity and temperature, the hypobacterial and allergen-free air environment saturated with aero ions enhance the therapeutic effect. A suggestion that it is the air saturated with saline dust that causes the main curative effect in the Speleotherapy of patients with respiratory diseases was first formulated by a Polish mining physician Feliks Bochkowsky. He noticed that the workers of salt mines did not get ill with lung diseases. In 1839 he founded the Salt Spa in Wieliczka near Krakow, which is still in operation. Originally it served for treatment of almost all diseases, and since 1958 it has been using for treatment of diseases like asthma, chronic and acute bronchitis, upper and lower airway diseases and allergies. Nowadays, salt mines are known to be used for therapeutic purposes in many other countries, such as Ukraine (Solotvino, Artiomovsk), Austria (Solzbad-Salzeman), Russia (Berezniky, Perm), Romania (Slanic, Praid, Seiged, Sovata, Ocna), Germany (Teufelshohle), Hungary (Tapolca), Azerbaijan (Nakhichevan), Kirgizia (Chon-Tous) and others. Speleotherapy has been acknowledged as a highly effective medication-free treatment method. Great experience in the treatment of patients with various forms of chronic nonspecific pulmonary diseases has proved Speleotherapy to be very effective under the conditions of the microclimate of the salt mine in Solotvino (Ukraine). The therapeutic effect has been proved by the data of biochemical immunological and microbiological research (Simyonka, 1989; Slivko, 1980; Yefimova et at, 1990; Zadorozhnaya et at, 1986). The main disadvantage of Speleotherapy is its availability – i.e. lack of appropriate caves or salt mines. This brings problems such as the necessity for transportation, adaptation for patients who come from different climates, accommodation for patients near caves (treatment is performed in the way of rehabilitation and treatment center, so it is necessary to stay in this location for several days or weeks) and usually limited number of beds. Speleotherapy also makes a great demand on a patients’ time and total costs which should be considered. All these problems prevent the treatment from being wide spreading. So Halotherapy has been worked out. Halotherapy is the method of natural therapy, which takes from Speleotherapy the main healing factor – an aero dispersed environment saturated with dry sodium chloride aerosol, while eliminates the disadvantages mentioned above. Halotherapy is performed in a special room with salt-coated walls and floor – the Halochamber, which can be built almost anywhere; customers or patients are not compelled to travel far from theirs homes and spend a long time on therapy in natural caves but they can benefit from coming to a built “cave” near their homes, with the same therapeutic effects. Of course, such halochambers can be helpful for treatment only in cases where the strict requirements are fulfilled, partly hygienic – mainly it is a pure air environment without allergens, pathogenic bacteria, mould, etc., and partly therapeutic – sufficient concentration and proper composition of salt aerosol, temperature and humidity of the air. Medical research which focused on treatment of various respiratory diseases confirmed that Halotherapy resulted in improvements of the clinical state in the most patients. Russia has become the world leader in developing and testing new and increasingly effective drug-free physical therapies without side effects. Many of these clinical trials have focused on Halotherapy as a treatment for asthma, chronic bronchitis and the entire range of upper and lower respiratory tract diseases. Most of the published work on Halotherapy has appeared in Russian journals and publications. The Russian Ministry of Public Health sanctioned the Halotherapy method in 1990. So that Halotherapy could be effective, some basic criteria must be fulfilled: mainly it is the composition of salt rocks – they should contain at least 90 % of NaCl (sodium chloride – pure salt), according to some works even more then 97 %; the rest of the composition contains other minerals and trace elements; temperature should be kept in range from 18 to 24 °C (65 – 75 °F) and the humidity level between 45 and 60 %. And of course, the environment inside may not contain any pathogenic bacteria or mould. Speleo/Halotherapy is an effective method of treatment for chronic respiratory diseases, working well with or without medical treatment and without any known side effects. Because of this, even pregnant women with asthma or other respiratory diseases could use this therapy without any harm to the child. Although halotherapy provides significant improvement for a patients’ clinical state, sometime even resulting in full recovery, it is not a substitute for medical treatment. In the case of an already existing disease, it can only be used as an adjuvant to help improve the quality of the patients’ life, reducing the antibiotic, corticoid or steroid intake, reducing the rate of annual hospitalizations and decreases the frequency of respiratory diseases attacks. The combination of conventional and alternative medicine leads to the best results! Other interesting information about Speleotherapy, Halotherapy, etc.